AgroAtlas - Pests - Agriotes gurgistanus Faldermann - Click Beetle (wireworm), Steppe Wireworm. 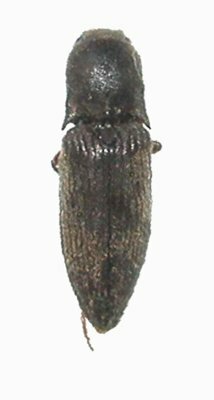 Agriotes gurgistanus Faldermann - Click Beetle (wireworm), Steppe Wireworm. Class Insecta, order Coleoptera, family Elateridae, subfamily Elaterinae, genus Agriotes. Body length 9-13 mm, maximum width 2.9-4.5 mm. Head with rough, large, umbilicate punctures with intervals between them that are less than puncture diameter. Antennae go behind apex of pronotal hind angled at 0.5 to 1.0 length of last antennal segment. Pronotum as long as it is wide, or barely wider than it is long; uniformly punctured. Black with brownish-black elytra, or upper side russet, or elytrae russet; pronotum darker, but antennae, legs, and sometimes abdomen are lighter. Covered entirely with silky yellowish-gray hairs. Larva is russet dorsally, up to 35 mm in length and 2.5 mm in width, prolate and rigid. For their original habitus the larvae are usually called Wireworms. Mandibles smooth at apex or with barely noticeable subapical swelling. Overwinters during larval stage exclusively. Pupation occurs in the second half of May or June; beetles start to emerge from soil from the end of May until the beginning of June. Flight occurs from June until the beginning of August (depending on latitude); in the Krasnodar Territory the flight occurs from the 1st third of July, reaching maximum levels in the middle of July. The period of adult activity lasts for 1-1.5 months. Fecundity is about 200-220 eggs. Eggs develop for 2-3 weeks. Larval development lasts for an incomplete 4 or a full 3 years (in the south). Pupae develop over 10-16 days. The entire developmental cycle of one generation lasts 3 to 4 years. Steppe and forest-steppe zone of the European continent, including Crimea, eastward to the Ural River, the Caucasus and Transcaucasia. An insular part of the insect range occurs on steppe-like southern slopes near Ukhta, Komi. Outside the Former USSR it is known in the Balkans, south-eastern Europe, and Asia Minor. Beetles are active during the second half of the day. Flight takes place during twilight, though females practically do not fly; they bury themselves in soil 5-12 days after mating. Eggs are laid in soil in small groups at a depth of 3-8 cm near roots of various plants. Oviposition lasts 5 to 10 days. Larvae eat seeds, sprouts, young caules, and roots, locating them by odor. Larvae are capable of surviving without nutrition for a long time, being rather resistant to low soil humidity; they are capable of surviving for 3 months, in extremely dry soil (water content, 4.2%). Larvae are susceptible to low temperatures, perishing at 3.9°C. Searching for optimal conditions, the wireworms move through the soil.. For example, they rise to the warmed upper layer of soil in early spring, and descend 30-50 cm away from the freezing upper layer in late autumn. Larval body is well adapted to movements in the soil, being smooth and firm. Cuneate head serves as a digging organ, legs work as locomotor apparatus, and caudal appendage is used for fixation of body position and for reverse movements. Xerophilous species. Larvae prefer to develop in plough-land and meadow soils, in steppe and meadow-steppe plant groups in the northern portion of its. range, and sometimes under tree canopies and shrubs in the south. Reduction of wireworm numbers is caused by birds (rooks, crows, starlings, etc.) during plowing, by parasitic and predatory insects (especially by ground beetles of the genera Carabus, Calasoma, Harpalus, Amara, etc. ), and also by diseases (bacterioses, fungal infections). One of the most common harmful agricultural insect pests of southern Russia and Ukraine. This is a polyphagous pest, damaging almost all agricultural crops including small cereals, maize, potato, sunflower, sugar beet, tomatoes, peanut, tobacco, vine, melons, cabbage, carrot, onions, garlic, beans, alfalfa. It is dangerous to maize and especially to vegetables. Control measures include duly and thorough treatment of soil (removal of stubble and plowing, cultivation of fallow lands, interrow treatment of cultivated crops), crop rotation, mineral fertilizing and dung application, weed control, chemical treatment of seeds and application of soil insecticides, and arrangement of poison baits on especially valuable fields. Pheromone traps are a prospective means for the purposes of forecasting.